A Mass of Christian Burial will be held at Notre Dame Catholic Church on Wednesday, September 5, 2018 at 11:00 a.m with visitation one hour prior with Father Dennis Cain officiating. Burial will be in Calvary Cemetery. Visitation will be held on Tuesday, September 4, 2018 from 4-7 p.m at Hindt-Hudek Funeral Home in Cresco, IA. William John Martinek was born on June 12, 1938, in Cresco, IA to John and Adella (Pecinovsky) Martinek. He graduated from Rudolphium High School in Protivin, IA. On May 25, 1985, Bill was united in marriage to Barbara (Brannon) Pecinovsky at Assumption Catholic Church in Cresco. 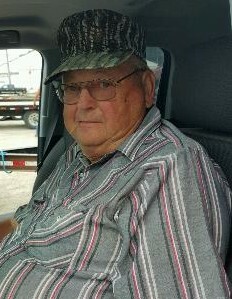 He enjoyed fishing, golfing, bowling, and trips to the casino, but his greatest love was farming. Bill spent his life farming south of Cresco and loved spending time in the combine. He was a member of the Protivin Chapter Knights of Columbus, served on the Board of Directors for Howard County Mutual Insurance, and was a member of the Farm Bureau for 50 years. Bill is survived by his wife of 33 years, Barb Martinek; three sons Dean (Rena) Pecinovsky of Grand Meadow, MN, Duane (Susan) Pecinovsky of Clear Lake, IA, and Kevin (Nancy) Pecinovsky of Cresco, IA; grandchildren Jennifer (Frank) Roth of Buffalo Center, IA, Brandon (Holly) Brink of Garner, IA, Brandon (Shannon) Pecinovsky of Preston, MN, Cori Pecinovsky of Grand Meadow, MN, Luke Pecinovsky of Grand Meadow, MN, and Nicole Pecinovsky of Cresco, IA; great-grandchildren Brandon Roth, Ella Brink, Lila Brink, and William Brink; siblings Sister Annette Martinek of Milwaukee, WI, Geraldine Kerian of Waverly, IA, Agnes Lukes of Protivin, IA, John J. Martinek of Cresco, IA, Charles Martinek of Bay City, WI, Joe Martinek of New Mexico, Mary (Gabe) Klimesh of Spillville, IA, and Theresa (Mike) Lensing of Protivin, IA, and sister-in-law Doris Hageman of Sterling, IL.